We both have the original Nintendo 3DS (2011). They both work fantastic, despite them being six years old. Nintendo has decided to let go of the original 3DS since they’ve come out with many other versions since then. We both knew we’d have to get a new handheld at some point and were thinking of upgrading to a 3DS XL. Then Nintendo announced the 2DS XL. While our Nintendo 3DS systems still work, their battery life definitely isn’t what they used to be. It was no problem, of course, and they both still have plenty of room for game storage. However, we figured that the 2DS XL would be nice upgrades, new handhelds with bigger screens and without the 3DS slide that we honestly never used from the 3DS systems. We’re both enjoying our 2DS systems, with Miitopia being the first game on them! I’m definitely enjoying the new system. I felt like it was Christmas (after we went to two GameStops so we could each get a system). Yes, there’s only Miitopia on the system, but the handheld itself is great. I enjoy the bigger screen and I think it’s cool that the game cartridge gets shielded and locked at the bottom. It won’t fall out and it won’t get ruined. It’s right next to the teeny-tiny SD card and the stylus. I’ll admit that I have a hard time getting the stylus back in. However, I tend to use my fingers anyway. I nearly forgot our quest to get the two systems… We went to our favorite GameStop at the mall, and the employee mentioned how they only had one system. Rachel immediately told me, “I’ll fight you,” and the employee rolled with it, stating that he’d “put the system in the middle so [we] could duke it out.” To prevent us from ruining the store, though, he kindly offered to call the nearest GameStop to see if they had another system to hold for us, which they did. The bigger screen is my favorite aspect of the 2DS XL. Going back to the 3DS is strange because the screen looks so much smaller! You would have beaten me anyway… With that being said, we both ended up with the black and blue 2DS. Both of us liked that color better than the white and orange, but to differentiate it a bit, I would have gone for the white and orange. (I’m most likely going to put Pokemon stickers on it anyway.) But both stores only had the black and blue left, which was fine by us. And yeah, we’ve both been playing Gameboy Advance games so while playing Miitopia so I’m going back and forth between the 2DS XL and my original DS. Not 3DS, just a regular old Nintendo DS. Do you have a 2DS system? What do you think of Nintendo’s line of handheld consoles? Let us know in the comments below! Our attempt to get a Nintendo Switch this past weekend did not work out… Cross your fingers for us that we somehow get one this week! In the meantime, Rachel and I are keeping ourselves busy so we don’t end up wallowing in self-pity that we still don’t have the latest console. While we don’t have the Switch just yet, we do still have the Wii U and the lovely Virtual Console with plenty of games to explore. One of the first games that I remember downloading on the Virtual Console was Fire Emblem: Blazing Sword. I have the actual GameBoy Advance cartridge of the game, generously gifted to me from my parents for one Christmas or birthday years ago. It was probably fairly soon after I had just gotten into the franchise after Sacred Stones, eager to dive further into the Fire Emblem series. It had been a little difficult for my parents to find the game, but they eventually found a used one, which was more than okay with me. I burned through the first section of the game, Lyn’s story, on that day. However, when I picked it up again the next day, none of my progress was saved. I was a little disappointed and confused, sure I had saved it, but I figured the only thing to do would be to play it again. Apparently the game was so used that the saving mechanic no longer worked. My young-self’s brilliant solution was to keep the GameBoy SP on 24/7, plugged in when necessary, so I could experience the game. I believe I had beaten the next section of the game, Eliwood’s story, before finally giving my GameBoy SP a rest. I never played the game again until I downloaded it on the Virtual Console. Over the weekend, I started a new game on it, enjoying the nostalgic feelings as the GameBoy graphics popped up on the Wii U’s Gamepad. I don’t remember too much of Eliwood’s story, so I’m looking forward to playing through it while waiting to get a Switch. What have you been playing lately (I mean, besides Breath of the Wild, haha)? Part three of my journey is complete! I went through Kanto and Johto, and now I can say I’m the champion of the Hoenn region. Being a Gameboy Advance game, the graphics are subpar compared to what they look like these days. However, if you push the fact that it’s 2016 aside, the graphics aren’t bad at all. The screen is clear and in color to see what’s going on in the world of Pokemon. The sprites are still only an inch tall, but I find that great and amusing. Like most Pokemon games, you use two buttons throughout the whole game, for the most part. It’s easy enough to play and to figure out. It’s not complicated, which is what I love when I play games. My fingers don’t have a lot to do. Again, like most Pokemon games, you go on a Pokemon journey. You fill up the Pokedex given to you by the professor, you collect eight gym badges, and challenge the Elite Four and Champion to be the very best. In the meantime, you save the world from Team Magma or Team Aqua, depending on which game you’re playing. It was fun to play Emerald again. I haven’t played it in such a long time, probably since it came out way back when. 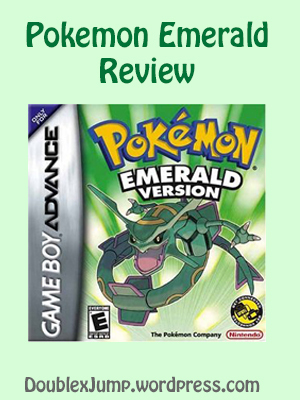 I’ve played Omega Ruby and Alpha Sapphire since they came out, but Emerald brings that nostalgia feeling back.